You've got to give it to them, the shopkeepers in the souk (moroccan market) are honest. If you were to drop your wallet, overpay or forget your shopping bag, chances are you'll hear the Arabic tune of a Moroccan store owner yelling and whistling his heart out in an effort to return the possessions of yet another heat affected tourist. It was decided that I was to be sent to the spice shop, Steve Brown as my wingman and Moroccan Moment Documenter (cameraman), to learn about the spices that shape this nation. Four mint teas and an hour later I was sent stumbling home, pockets lighter feeling like something went desperately wrong. There was no lying, no cheating, no tricks but did I really need 6 grams of Saffron and a soccer ball sized bag of the finest spices in North Africa? How did he do it? Where was my wingman when I needed him most? 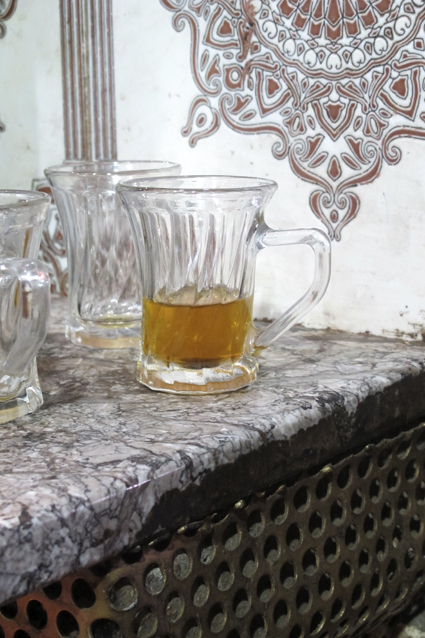 This dangerous substance is know as Moroccan Whiskey. Drink too much and you may make some bad decisions.